Today we’re going to talk about (cue the Sergio Leone western soundtrack) “Termite Eterminators”. Getting rid of termites in your home or building is, as a general rule, not a simple deal. Say one discovers an infestation of fleas or roaches in your home. Often these pests can be dealt with by using over-the-counter products. This is not the case with a drywood or subterranian termite infestation. In truth lots of household chemicals will kill termites. If your lucky enough and are able to get the chemicals on them. Getting the right chemicals and applying them to the entire termite infestation is the trick and that requires special tools and training. I love this part. This is when Hi Tech Termite Control rides in! On a truck though, not a horse. Though that would be great. 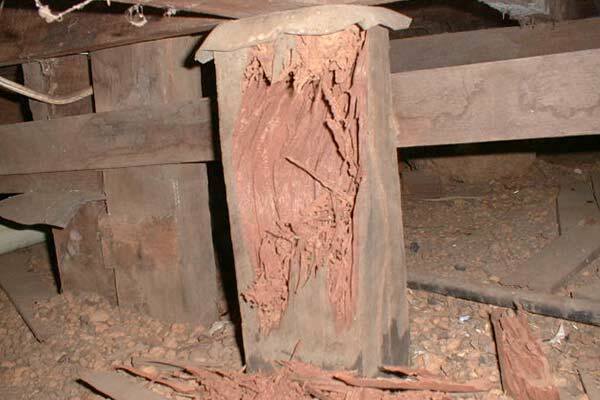 When one of our inspectors comes to your home, he will first verify that termites are the culprit. As it turns out there are other insects like carpenter bees and some species of ants that can also do damage to your property. Some people may also mistake water damage for termite damage. In many instances Hi Tech can help with wood repair too. I’ll write a post about that another time. Our inspector will use long probes, heat sensors, sound sensors, infrared cameras, hammers and drills to look for termite damage and most importantly determine the extent of the infestation. Chemical treatments can be used when microwaving proves impractical. Hi-Tech utilizes Termidor injections. Termidor spreads like a virus through a termite colony to eliminate it. Fumigation is going to be the last and best resort if your inspector discovers heavy infestation in several areas that are mostly inaccessible. I’ve written before how dedicated termites are. They’re bots man! They don’t get tired or bored and never take a day off. But they are small. So it takes years for termites to do significant damage to a home. So if you discover termite signs on your property, be concerned, but don’t panic you have time to get the right termite exterminator. Before making a decision, compare Hi Tech’s warranty or guarantee with other offers. And of course it’s always a good idea to work with a termite exterminator that is properly licensed and qualified. Like us the Hi-Tech Team, your source for free termite inspections in Los Angeles, San Diego and all surrounding areas. I’ll have more on your termite control options in future posts. Remember if you are in need of San Diego termite exterminator call Hi-Tech today!